SUMMARY: According to our 2014 survey of the MarketingSherpa audience, personalization is one of the top questions they want to see researched. In this week’s chart, we bring you exclusive data based on 1.5 billion shopping sessions on the usage and revenue associated with different types of personalized product recommendations. Read on to learn which types ecommerce websites over- and underused, and watch Meir Tsinman, President, Medical Supply Depot, share how his company is using personalized product recommendations. In July 2015, Barilliance prepared an exclusive data report for MarketingSherpa readers. The team pulled data from 1.5 billion shopping sessions over a period of three months in the second quarter of 2015 (Q2 2015). The data was collected from ecommerce websites that use the Barilliance personalized product recommendations engine. The sites are located in 26 countries across North and South America, Europe and Australia, and sell products ranging from clothes, sports, food and wine to books, music, office supplies and computers. We sat down with Meir Tsinman, President, Medical Supply Depot, at the MarketingSherpa Media Center at IRCE 2015 to learn how personalization helps his ecommerce company better serve its customers. You can watch the full interview with Tsinman below, and read on for additional analysis and insights. 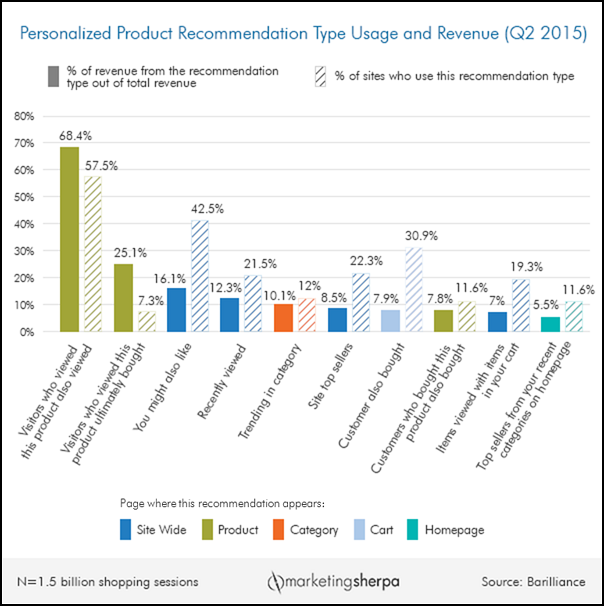 During Q2 2015, 11.5% of the revenue on the ecommerce sites studied was attributed to personalized product recommendations. Throughout the 1.5 billion shopping sessions, visitors were exposed to more than 20 recommendation types. The dynamic recommendations were personalized based on visitor data, behavior and history. The chart above presents the 10 product recommendation types that resulted in the highest revenues. "Visitors who viewed this product also viewed" was the recommendation type that generated the most revenue — more than two-thirds (68.4%) of all revenue. Another significant revenue generator included "Visitors who viewed this product ultimately bought." This was followed by "You might also like," which is a highly personalized product recommendation based on visitors’ current and past behaviors on the site. These results are hardly surprising since social proof, or our tendency to assume that an action is more correct if others are doing it, has often been tested, proven to work and consequently has become a buzzword in marketing. We requested this custom report from Barilliance’s behavioral data because we wanted to discover whether the tactics that most ecommerce websites use are the ones that generate the most revenue. The data shows some interesting discrepancies between what sellers think will positively influence their customers (percentage of sites using a type of recommendation) and what customers actually do (percentage of revenue from a type of recommendation). Higher revenue represents customers buying more items or buying higher valued items. Two categories showed the highest discrepancies. First, 30.9% of sites use "Customers also bought" on their cart page, while only 7.9% of revenue came from this type of recommendation. Second, though 42.5% of websites display "You might also like" sitewide, only 16.1% of revenue came from this type of recommendation. Another notable discrepancy was "Site top sellers" sitewide — 22.3% of sites were using it, while only 8.5% of revenue came from this type. The situation was reversed — a bigger percentage of revenue, and a smaller percentage of sites using this type of recommendation — with "Visitors who viewed this product ultimately bought" on the product page. Though 25.1% of revenue came from this type, only 7.3% of sites employed this recommendation type. What does this mean for marketers? As a whole, e-retailers might overestimate the value of presenting "Customers also bought" suggestions on the cart page and "You might also like" suggestions sitewide. They might also underestimate the value of presenting customers with "Visitors who viewed this product ultimately bought" suggestions on the product page. If you are trying to decide which types of recommendations to use, determining when to present them might be a very important first question. Keep in mind that the goal is to make the customer’s journey through the sales funnel as simple and rewarding as possible — adding value while not distracting from the original purchase intent. Below you’ll find our five tips to help you put this data into action. Easier said than done. To learn what is relevant to a shopper on your site, you must first have a system in place for measuring that shopper’s past behavior and preferences, as well as to quickly react to them. Abby Bandel, Marketing Director, Barilliance, gave the following example: If a customer selects a shirt in size "small" on your site, that customer should not see suggestions for items that are not in stock in size "small" during that shopping session. Bandel mentioned dynamic images as a good way to make product recommendations appealing to the customer and easy to engage with. For example, when a shopper hovers over the image of a shirt, the image could change to give them another perspective without having to click on the product first. "Making the content dynamic in this way increases engagement and requires minimal input from the user," Bandel said. Bandel mentioned two common mistakes companies can make when implementing product recommendations. First, don’t cross-sell on the product details page. It’s distracting to your customer. "When shoppers browse the product detail page, they are in the research phase and they are still looking for the right product," Bandel explained, adding, "Instead, marketers should focus on similar options and upsells on product detail pages to help shoppers find the right product first." Second, avoid showing similar items on the cart page. "At this point, the shopper is closer to making a purchase and we don't want to distract her with similar options," Bandel said. "The shopping cart is the place to test cross-selling." As we reported in a recent MarketingSherpa article, "Ecommerce Chart: Online shopping behaviors of Millennials versus Baby Boomers," privacy is a concern among some online shoppers. Bandel said marketers can alleviate most privacy concerns by giving users control over the recommendations they receive. She gave two examples: allow them to delete their browsing history or invite them to provide feedback on the recommendations. While this article has mostly covered automated ways to recommend products to customers, don’t let technology cloud what your ultimate goal should be — helping the customer find products that will be valuable to them. Automated technology is an efficient way to achieve this but, if you focus on the ultimate goal, you may find other ways to help customers with product discovery. In his Media Center interview, Tsinman shared that his team’s quest to provide the most efficient and gratifying service experience to the customer began with implementing automated personalized product recommendations to make buying decisions easier for customers. However, he didn’t stop there. Medical Supply Depot is also growing its customer service team, as well as increasing its hours with plans to be available 24/7. "We want to make sure our customers have access to a live person pretty much at all times," Tsinman said.